Hunger is a mighty good thing. It is the greatest persuader I know of. It is a marvellous mover. Nations have learned that you can do most anything with a populace until they get hungry. But when they get hungry you want to watch out. There is a certain spirit of desperation that accompanies hunger. I wish we all had it spiritually. I wish to God we were desperately hungry for God. Wouldn’t it be glorious? Somebody would get filled before this meeting is over. It. would be a strange thing, if we were all desperately hungry, for God, if only one or two got filled in a service. Righteousness is just the rightness of God, The rightness of God in your spirit, the rightness of God in your soul, the rightness of God in your body, the rightness of God in your affairs, in your home, in your business, everywhere. God is an all-round God, His power operates from every side. The artists paint a halo around the head of Jesus to show that there is a radiation of glory from His person. They might just as well put it around his feet or any part of His person. It is the radiant glory of the indwelling God, radiating out through the personality. There is nothing more wonderful than the indwelling of God in the human life. The supremest marvel that God ever performed was when He took possession of those who are hungry. I will guarantee to you that after the crucifixion of Jesus there was a hundred and twenty mighty hungry folks at Jerusalem. I do not believe if they had not been mightily hungry they would have gotten so gloriously filled. It was because they were hungry that they were filled. We are sometimes inclined to think of God as mechanical; as though God set a date for this event or that to occur. But my opinion is that one of the works of the Holy Ghost is that of preparer. He comes and prepares the heart of men in advance by putting a strange hunger for that event that has been promised by God until it comes to pass. The more I study history and prophecy the more I am convinced that when Jesus Christ was born into the world He was born in answer to a tremendous heart-cry on the part of the world. The world needed God desperately. They wanted a manifestation of God tremendously, and Jesus Christ as the Deliverer and Saviour came in answer to their soul cry. Here is what I want you to get. If it was going to come to pass mechanically on a certain date, there would not have been any necessity for Daniel to get that awful hunger in his soul, so that he fasted and prayed in sackcloth and ashes, that the deliverance might come. No sir, God’s purposes come to pass when your heart and mine get the real God-cry, and the real God-prayer comes into our spirit, and the real God-yearning gets hold of our nature. Something is going to happen then. No difference what it may be your soul is coveting or desiring, if it becomes in your life the supreme cry, not the secondary matter, or the third, or the fourth, or fifth or tenth, but the FIRST thing, the supreme desire of your soul, the paramount issue, all the powers and energies of your spirit, of your soul, of your body are reaching out and crying to God for the answer, it is going to come, it is going to come, it is going to come! I lived in a family where for thirty-two years they never were without an invalid in the home. Before I was twenty-four years of age we had buried four brothers and four sisters, and four other members of the family were dying, hopeless, helpless invalids. I set up my own home, married a beautiful woman. Our first son was born. It was only a short time until I saw that same devilish train of sickness that had followed father’s family had come into mine. My wife became an invalid, my son was a sickly child. Out of it all one thing developed in my nature, a cry for deliverance. I did not know anything about the subject of healing, notwithstanding I was a Methodist evangelist. But my heart was crying for deliverance; my soul had come to the place where I had vomited up dependence on man. My father had spent a fortune on the family to no avail, as if there was no stoppage to the train of hell. And let me tell you, there IS NO HUMAN STOPPAGE because the thing is settled deep in the nature of man, too deep for any material remedy to get at it. It takes the Almighty God and the Holy Spirit and the Lord Jesus Christ to get down into the depth of man’s nature and find the real difficulty that is there and destroy it. My brother, I want to tell you, if you are a sinner tonight and away from God, and your heart is longing, and your spirit asking, and your soul crying for God’s deliverance, He will be on hand to deliver. You will not have to cry very long until you see that the mountains are being moved, and the angel of deliverance will be there. I finally got to that place where my supreme cry was for deliverance. Tears were shed for deliverance for three years before the healing of God came to us. I could hear the cries and groans and sobs, and feel the wretchedness of our family’s soul. My heart cried, my soul sobbed, my spirit wept tears. I wanted help. I did not know enough to call directly on God for it. Isn’t it a strange thing that men do not have sense enough to have faith in God for all their needs, do not know enough to call directly on God for physical difficulties as well as for spiritual ones? But I did not. But bless God, one thing matured in my heart, a real hunger. And the hunger of a man’s soul must be satisfied, it MUST be satisfied. It is a law of God; that law of God is in the depth of the spirit. God will answer the heart that cries; God will answer the soul that asks. Christ Jesus comes to us with divine assurance and invites us when we are hungry to PRAY, to BELIEVE; to take from the Lord that which our soul covets and our heart asks for. So one day the Lord of heaven came our way, and in a little while the cloud of darkness, that midnight of hell, that curse of death was lifted, and the light of God shone into our life and into our home, just the same as it existed in other men’s lives and other men’s homes. We learned the truth of Jesus and was able to apply the divine power of G0d. We were healed of the Lord. Brethren, begin to pray to get hungry. At this point I want to tell you a story. I was out on a snow-shoe trip at Sault ste Marie, Michigan, where they used to have four and five feet of snow. I tramped for thirty miles on my snow shoes. I was tired and weary. I arrived home and found my wife had gone away to visit, so I went over to my sister’s home. I found they were out also. I went into the house and began to look for something to eat. I was I was nearly starved. I found a great big sort of cake that looked like corn broad. It was still quite warm and it smelled good. I ate it all. I thought it was awful funny stuff, and it seemed to have lumps in it. I did not just understand the combination, and I was not much of a cook. About the time I had finished it my sister and her husband came in. She said, “My you must be awful tired and hungry.” I said, “I was but I just found a corn cake and ate the whole thing.” She said, “My goodness, John, you did not eat that?” I said, “What was it, Irene?” “Why that was a kind of cow bread, we grind up cobs and all.” You see it depends on the character and degree of your hunger. Things taste mighty good to a hungry man. If you wanted to confer a peculiar blessing on men at large, it would not be to give them but to make them hungry, and then every thing that came their way would taste everlastingly good. I love to tell this story because it is the story of a hungry man. 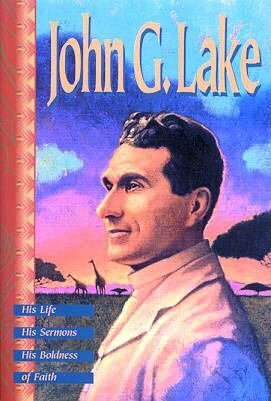 A short time after I went to South Africa and God had begun to work very marvellously in the city of Johannesburg, a butcher who lived in the suburbs, was advised by his physicians that he had developed such a tubercular state he might not live more than nine months. He wanted to make provision that his family be cared for after he was gone, so he bought a farm and undertook to develop it that when he died his family would have a means of existence. One day he received a letter from friends at Johannesburg, telling of the coming of what they spoke of as “the American. Brethren,” and of the wonderful things that were taking place. Of how so-and--so, a terrible drunkard, had been converted; of his niece who had been an invalid in a wheel chair for five years, had been healed of God; how one of his other relatives had been baptised in the Holy Ghost and was speaking in tongues; other friends and neighbours had been baptised and healed of the powerful change that had come in the community, and all the marvels a vigorous work for God produces. Dan VonVuuren took the letter, crawled under an African thorn tree. He spread the letter out before God, and began to discuss it with the Lord. He said, “God in heaven, if you could come to Mr So-and-so, a drunkard, and deliver him from his sin and save his soul and put the joy of God in him; if you could come to this niece of mine, save her soul and heal her body and send her out to be a blessing instead of a weight and burden upon her friends; if you could come to so-and-so, so they, were baptised in the Holy Ghost and speak in tongues; Lord, if you can do these things at Johannesburg, you can do something for me too.” And he knelt down, put his face to the ground, and cried to God that God would do something for him. And don’t forget it, friends, I have a conviction that that morning Dan VonVuuren was so stirred by the reading of that letter that His desire to be made whole got bigger than anything else in his consciousness. His heart reached for God, and bless God, that morning his prayer went through to heaven and God came down into his life. In ten minutes he took all the breath he wanted; the pain was gone, the tuberculosis had disappeared, he was a whole man. But that was not all, he not only received a great physical healing, but God had literally come in and taken possession of the man’s	life until he did not understand himself any more. In telling me he said, “Brother, a new prayer from heaven was born in my spirit. I had prayed for my wife’s salvation for eighteen years, but I could never pray through. But that morning I prayed through. It was all done when I got to the house. She stood and looked at me for two minutes, until it dawned in her soul that I was gloriously healed of God. She never asked a question as to how it took place, but fell on her knees, threw her hands up to heaven, and said, “Pray for me. Dan, for God’s sake, pray for me. I must find God today,” and God came to that soul. He has eleven children, splendid young folks. The mother and he went to praying and inside of a week the whole household of thirteen had been baptised in the holy Ghost. He went to his brother’s farm; told the wonder of what God has done; prayed through and in a little while nineteen families were baptised in the Holy Ghost. God so filled his life with His glory that one morning God said to him, “Go to Pretoria. I am going to send you to different members of Parliament.” He was admitted into the presence of Premier Louis Botha. Botha told me about it afterwards. He said, “Lake, I had known VanVurren from the time he was a boy. I had known him as a reckless, rollicking fellow. But that man came into my office and stood ten feet from my desk. I looked up, and before he commenced to speak, I began to shake and rattle on my chair. I knelt down, I had to put my head under the desk and cry to God.” Why he looked like God; and talked like God. He had the majesty of God. He was superhumanly wonderful. Then he went to the office of the Secretary of State, then to the Secretary of the Treasury. Almost the same thing took place in every instance. For eighteen days God kept him going from this one to that one; lawyers, judges and officials in the land, until every high official in the land knew there was a Gos and a Christ and a Saviour, and a baptism of the Holy Ghost, because VonVuuren has really hungered after God. I was sitting here tonight before the meeting and began reading an old sermon I preached to a men’s club at Spokane, Washington eight years ago, entitled “The Calling of the Soul.” In it I observed I recounted the story of the original people who came to the Parham School in 1900, and whom in answer to the cry of their soul God came and baptised them in the Holy Ghost. All the Apostolic Faith Churches, and Missions, and Assemblies of God, and other movements are the result. I knew Brother Parham’s wife and his sister-in-law, Lillian Thistleweight. She was the woman that brought the light of God for real sanctification to my heart. It was not her preaching or her words. I sat in Fred Bosworth’s home one night before Fred thought of preaching the gospel. I listened to that woman telling of the Lord God and His love and sanctifying grace and power, and what real holiness was. It was not her arguments or logic; it was herself; it was the divine holiness that came from her soul; it was the living Spirit of God that came out of the woman’s life. I sat way back in the room, as far way as I could get. I was self satisfied, doing well in the world, prosperous with all the accompaniments that go with successful life. But that night, my heart got so hungry that I fell on my knees, and those who were present will tell you yet that they had never heard anybody pray as I prayed. Bosworth said long afterward, “Lake, there is one instance that I shall always remember in your life; that was the night you prayed in my home until the rafters shook, until God came down, until the fire struck, until our souls melted, until God came in and sanctified our hearts.” All the devils in hell and out of hell could not make me believe there is not a real sanctified experience in Jesus Christ; when God comes in and makes your heart pure and takes self out of your nature, and gives you divine triumph over sin and self, blessed be the Name of the Lord! Beloved, pray to get hungry. Coming back to Dan VonVuuren. For several years before I left Africa he went up and down the land like a burning fire. Everywhere he went sinners were saved, sick were healed, men and women were baptised in the Holy Ghost, until he set the outlying districts on fire with the power of God; and he is going still. Later Brother Parham was preaching in Texas. A coloured man came into his meeting by the name of Seymour. In a hotel in Chicago he related his experience to Brother Tom and myself. I want you to see the hunger in that coloured man’s soul. He said he was a waiter in a restaurant and preaching to a church of coloured people. He knew God as Saviour, as the sanctifier. He knew the power of God to heal. But as he listened to Parham he became convinced of a bigger thing, the baptism of Holy Ghost. He went on to Los Angeles without receiving it, but he said he was, determined to preach all of God he knew to the people. He said, “Brother, before I met Parham, such a hunger to have more of God was in my heart that I prayed for five hours a day for two and a half years. I got to Los Angeles, and when I got there the hunger was not less but more. I prayed, God, what can I do? And the Spirit said, pray more. But Lord, I am praying five hours a day now. I increased my hours of prayer to seven, and prayed on for a year and a half more.” “I prayed God to give me what Parham preached, the real Holy Ghost and fire with tongues and love and power of God, like the apostles had.” There are better things to he had in spiritual life but they must be sought out with faith and prayer. I want to tell you God Almighty had such a hunger in that man’s heart that when the fire of God came it glorified him. I do not believe that any other man in modern times had a more wonderful deluge of God in his life that God gave to that dear fellow. Brother Seymore preached to my congregation, to ten thousand people, when the glory and power of God was upon his spirit, when men shook and trembled and cried to God. God was in him. of the Spirit that men know, the is due to come. It will come! Bless God, it will come. It will come in more ways than you ever dreamed of. God is not confined to manifesting himself in tongues and interpretation alone. His life in man is rounded. I did not know how much of an asking it was in my nature, and it seemed sometimes that it had drifted away, until I was in my thirtieth year, I was invited to come to Chicago to join an association of men who were establishing a Life Insurance Association. They said, “Lake, we want you to manage this Association.” We dickered about the matter for three weeks until they came to my terms, and finally the president said, “Step into this office until we show you something. We have a surprise for you.” And I stepped into an office just exactly the duplicate of John A. McCall’s office, and there in the centre was a desk of pure mahogany, and instead of the name of John A. McCall, it was John G. Lake, in mother of pearl. I had never spoken of that soul desire to a person in the world. Friends, there is a something in the call of the soul that is creative. It brings things to pass. Don’t you know that when the supreme desire of your heart goes out to God, all the spiritual energy of your nature and the powers of God that come to you begin to concentrate and work along that certain line, and form and form, and there comes by the unconscious creative exercise of faith into being that which your soul calls for. That is the creative action of faith, you and God together working out and evidencing the power of creative desire. Ye shall receive the desire of your heart if you come before Me in prayer and supplication, for I am a God that answers my children. Go ye forward in the battle for I shall be with you and fulfil the desire of your heart, Yes, pray that ye may become hungry. Call and I shall answer, for I am a God that hears. I shall answer your call. Come before Me; humble yourselves before My feet, and I shall answer your call. Be ye diligent before Me, and pray, yea, be ye in prayer and supplication, for ye are living in the last days, and my Spirit shall not always strive with men. But ye that humble yourselves before Me will know I shall be your God. I shall strengthen you on the right hand and on the left, and ye shall understand and know that I am your living God. In other words, shut up your praying. Get up out of there. Moses, you and I are one, stretch forth your hand and divide the sea. You have all there is of me and I have all there is of you. We are one and indivisible. God and man becomes one. The heart of man, the mind of man, the soul of man enters into God, and God into him. The divine fires of the eternal Christ, by the Holy Ghost, come from heaven, and the lightnings of Jesus flash through the life, bless God, and the power of Christ invigorates and manifests and demonstrates through that relationship. Bless God, He put the high vision of the glorified Christ and the glorified Christian - not a man simply saved from sin, but a man saved from his sins, sanctified by His power, infilled with His Spirit, re-created with and in Jesus Christ, one in nature, character and substance. My heart began to preach it, and my mouth gave the message, and my soul sent forth the word, and my spirit called such that wanted to be that character of man to come to the feet of the Son of God, and receive His blessing and receive His power. 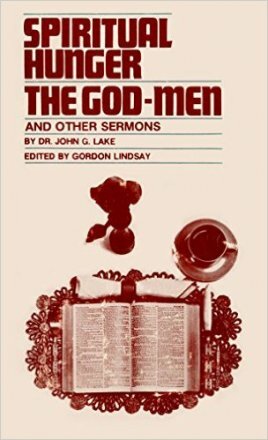 And, beloved, I tell you that in all the modern world there never was another hungered and twenty-five preachers who went out of a church to proclaim the power of God with greater power than that first hundred and twenty-five men did. The thing that was in my soul fired Dan VonVuuren’s soul and kindled the faith of the people. Where ever it spread it set men on fire for God. Friends, we need a coming up into God. This church, and the church around the world needs to come up into God. He have been travelling around in a circle, and digging our noses in the ground, and we have had our eyes on the ground, instead of up in the clouds, instead of up at the throne. Look up to the glorified One! If you want to see His bleeding hands, look to heaven where He is to see them. Do not look back to Calvary to see them. He is the risen, regnant, glorified Son of God in heaven, with all power and all authority; with the keys of hell and of death! He is the divine authority, the eternal overcoming, manifestation of God in Heaven. And you and the regnant, glorified Christ as one, are the divine manifestation of God. Come up to the Throne, dear ones. Let the Throne life, and the Throne love, and the Throne power and the Throne Spirit, and the Holy Ghost in heaven possess you, and you will be a new man in Christ Jesus! And your tread will be the march of the conqueror and your song the song of victory, and your crown the crown of glory, and your power the power of God.